This series of photos was taken right next to an active lava channel. 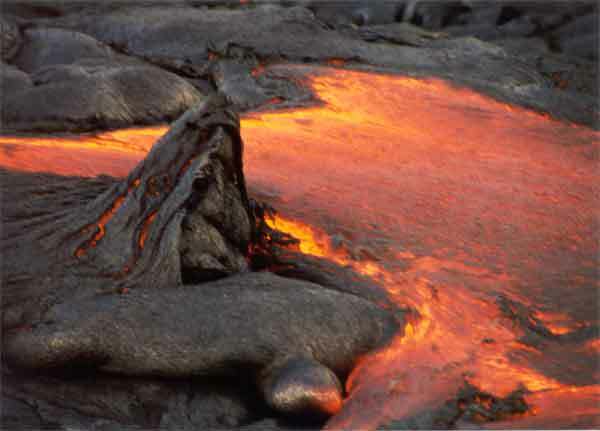 The lava moves slowly, on the order of a meter every few minutes to tens of minutes. The glow is best viewed at night but this of course makes it harder to walk the ~two miles to get to the channel from the road. The road used to go closer but was overrun by a flow and the park service wisely chose not to rebuild it. A nearly full moon nicely lighted our way. The red lava is a few thousand degrees celsius (2000 comes to mind, I'll check on this), enough that you don't want to touch it. You can however, get remarkably close to it - a very intense, dry heat. I found it interesting how a constant velocity flow could produce the folds of pahoehoe. It seemed that the leading edge would cool a little forming the trough of the fold. Then more lava would pile up behind this forming the ridge but all the while moving away from the source so there is room for the next trough. See little sketch.